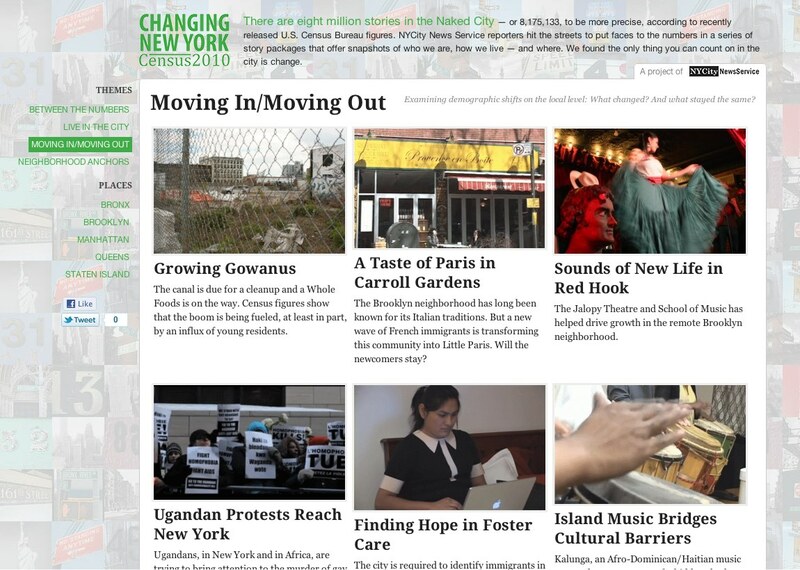 This is a quick visual overview of Changing NYC and CUNY J-Camp, two sites I designed, helped to produce, and launched at the CUNY J-School in the last couple of months. 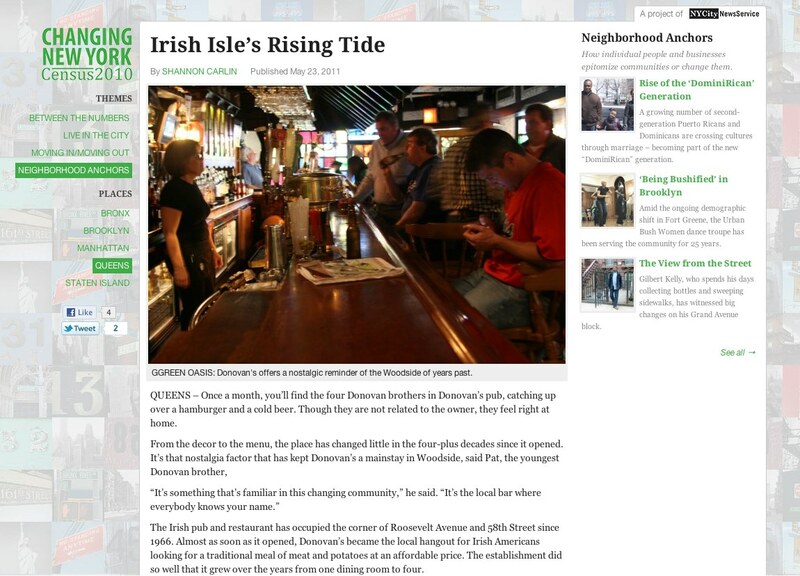 Published in May, Changing NYC showcases Census stories from Interactive II and Craft II J-School students. It was a joint project and includes audio, photo, video and live coverage. One of the significant challenges with this site was that, despite the Census being the overall theme, there were few threads between the stories. Furthermore, all stories needed to receive generally the same weight; no stories could be more “important” than others. The solution was to create three broad buckets to place the content in, Between the Numbers, Moving In/Moving Out, and Neighborhood Anchors, and then randomize the display order of the stories. Fortunately, with the grid view for theme landing pages, I think it worked out alright. On the single article view, the active theme and place terms are highlighted to give you a peripheral sense of what you’re looking at. On any view with a single piece of content, the site branding drops out of the header to the left column to allow the reader to make that content first and foremost on the page. The single photo view has a ribbon of all photos associated with a post, so you can see where you’re at in the series and quickly jump to another image. 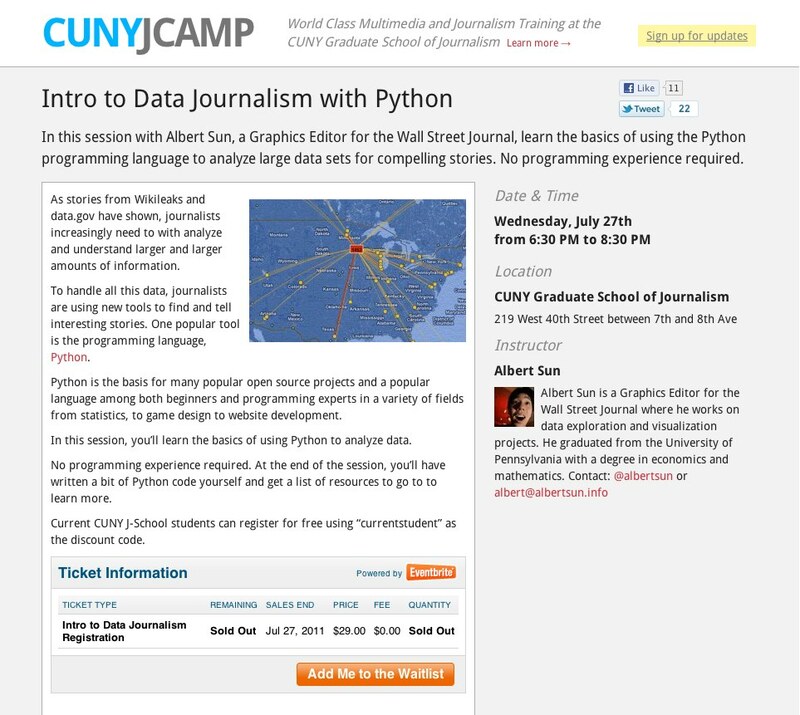 CUNY J-Camp is the J-School’s continuing education program. With the redesign of the site, the primary goal was to make it much easier to access and register for the variety of workshops offered. Secondary goals included educating new visitors on CUNY J-Camp, and making it much easier to stay in the loop about upcoming opportunities. The WordPress themes for both Changing NYC and CUNY J-Camp are available on Github.